Check out our fun coconut facts for kids. Have fun learning the how the name 'coconut' came about, how useful coconut palms are, the various ways we consume coconuts and much more. 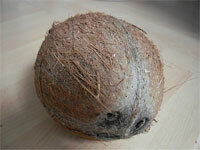 Read on and enjoy a range of interesting information all about coconuts! The coconut comes from the coconut palm tree which grows throughout the tropics and subtropics. The name coconut is derived from 16th century Portuguese sailors who thought the 3 small holes on the coconut shell resembled the human face so dubbed the fruit "coco" meaning "grinning face, grin, or grimace" The word nut was added in English later on. The coconut palm (Cocos nucifera) can grow up to 30 m (98 ft) tall and the leave fronds 4–6 m (13.1–19.7 ft) long. Technically the coconut fruit is a drupe not a nut. Typical drupes include peaches, plums, and cherries. In the early stages of a coconuts growth it contains high levels of water which can be consumed directly as a refreshing drink. The water is also gaining popularity as a sports drink as it contains good levels of sugars, dietary fiber, proteins, antioxidants, vitamins, and minerals. Coir (the fiber of the husk) can be used for making ropes, mats, brushes, sacks, caulking for boats, and as stuffing for mattresses. Coconut leaves have many uses such as for making brooms, woven to make baskets or mats, or dried and used as thatch for roofing. Wood from the trunk of the coconut palm was traditionally used to build bridges, houses, huts and boats in the tropics. The woods straightness, strength, and salt resistance made it a reliable building material. The coconut palm is grown in over 80 countries. The top 3 coconut producing countries in 2010 were the Philippines, Indonesia and India. In Thailand and Malaysia, trained pig-tailed macaques are used to harvest coconuts. In fact, there are still training schools for these monkeys in parts of the countries and each year competitions are held to find the fastest harvester. The Maldives have a coconut palm on the country's national coat of arms. It is the national tree and considered the most important plant on their islands.